Given the events that are taking place in the Church these days, I doubt that this post will receive much attention; however, as restoration of liturgical beauty has been a hallmark of Pope Benedict’s papacy, mentioning the local impact of his leadership seems noteworthy. Responsorial Psalm (cf. 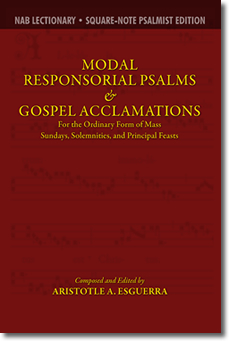 Ps 27: 1a, Modal Responsorial Psalms, p. 39): sung by psalmist; response sung by all. This year the schola cantorum was spread rather thinly, as only four men including myself were able to chant; others in the group were called to serve at the altar. I think moving towards actually enacting what the Church asks in regard to the singing of the words of the Mass instead of relegating it to a printed book ought to be a primary objective, given the Year of Faith theme for our diocese: “Evangelization through Beauty”. “For the celebration of the Eucharist with the people, especially on Sundays and feast days, a form of sung Mass (Missa in cantu) is to be preferred as much as possible, even several times on the same day.” Musicam Sacram Instruction on Music in the Liturgy, ¶27, emphasis added. Although some may argue that this instruction doesn’t apply to the current revision of the English-language Roman Missal, in fact the 2010 revision provides almost all of the resources needed for the priest to sing: the parts of the Mass proper to himself; many of the parts he sings with the faithful, e.g., the Sanctus; and the parts of the Mass that are better delegated to others, e.g., lector. From September to May as his schedule allows, Msgr. Bartylla celebrates a Latin Missa Cantata with Gregorian chant and vernacular readings on the first Tuesday of each month at noon; he celebrates an English Missa Cantata with Gregorian-inspired English plainsong on the third Tuesday of the month at noon. In the case of a scheduling conflict these Masses are usually transferred to the following Tuesday. All of these Masses take in the chapel of the Bishop O’Connor Catholic Pastoral Center [map]. Why this was ever called the “Opening Prayer” in the defunct English translation mystifies me. Does not prayer occur from the beginning of the Mass? It’s more logical to understand the Collect as the closing prayer of the Introductory Rites. “Faith comes from hearing.” Thus, I propose that during the Responsorial Psalm and other liturgical texts that share its nature, audible cues—such as slowing down at the final line of a verse and maintaining a consistent breathing pattern—are better than visual cues at fostering actual participation, i.e., intentional listening and prayerful singing. No visual cues were used to prompt the people’s singing of the refrain other than psalmist’s looking up from the ambo, which was done in conjunction with the aforementioned audible cues. A friend recently relayed to me a question asked of her by another friend regarding the difference between the High Mass and the Low Mass (within the context of the Extraordinary Form). I quipped: At High Mass, all the texts that are supposed to be uttered in song are sung. At Low Mass, all the texts that are supposed to be uttered in song are…muttered. There are other differences to be sure, but given the weight Church teaching has placed on sacred music, I focus on that primarily. And the musical differences between High Mass and Low Mass also apply to the Ordinary Form of the Roman Rite regardless of whether it is celebrated in its sacral languages.